This one comes courtesy of NotGraphs reader — and quite possibly New York Mets relief pitcher extraordinaire — Francisco Rodriguez. 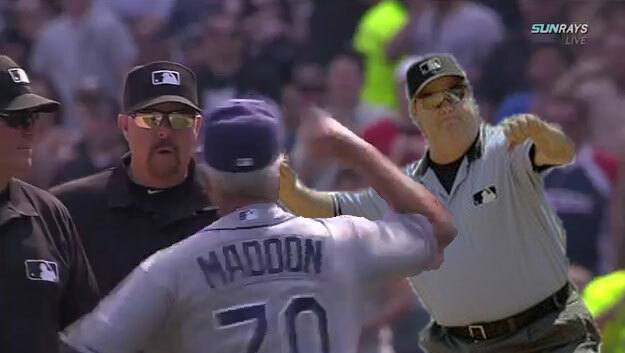 When there’s an ejection in baseball, I like to think Joe West knows about it. It’s innate. The Great Ejector closes his eyes and, boom, he’s there, tossing whoever needs to be tossed. Sunday afternoon on the South Side of Chicago, when Joe Maddon ejected the entire umpiring crew, Joe West was there, figuratively speaking. Because an ejecting party without Joe West is hardly an ejecting party at all. Thank you kindly, Francisco Rodriguez. Keep up the great work in New York, if you actually are K-Rod. We hoped you liked reading Joe West Was There in Spirit by Navin Vaswani! Commercial: Alec Baldwin! John Krasinski! Hats!